Haier, a Chinese brand company best known for its home appliances and electronics has introduced a smartwatch projector demoed at the mobile world congress 2018 in Barcelona. 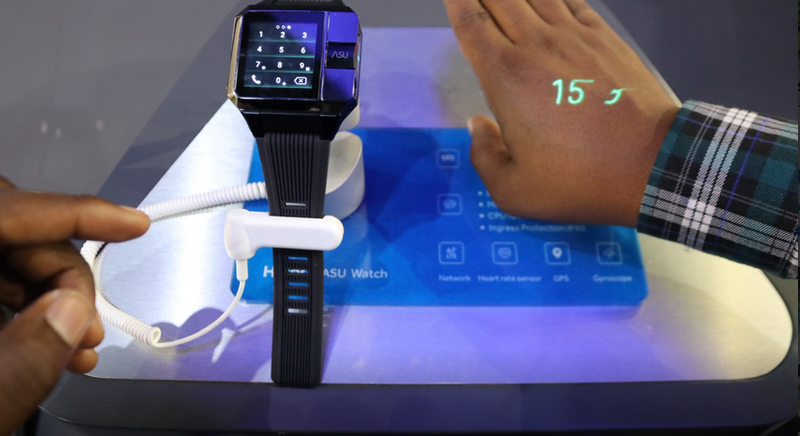 Although Haier is mostly known for the home appliances product, they also produce smartwatches from time to time but the latest smartwatch from Haier will have a projector and other features which makes it stand out from other smartwatches as this Haier's Asu smartwatch with a projector will be first of its kind in the smartwatch industry. We have seen lots of awesome smartwatches this year like ; The Samsung Gear Sport, Apple Watch 3, TicWatch E and The LG Watch Style but Haier's new smartwatch comes packed with a tiny projector which makes it amazingly oddly from other smartwatches. 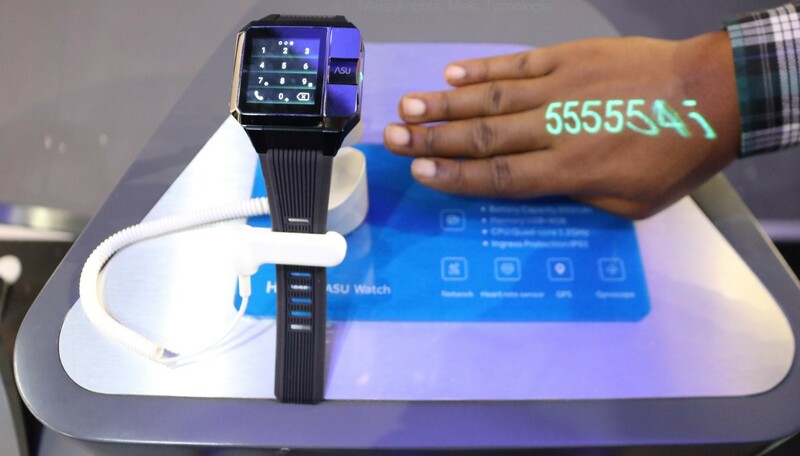 Haier's Asu smartwatch has a tiny projector, although tiny the projector is, it is also very bright and has a 480 × 854 pixel resolution. The smartwatch comes equipped with one gigabyte of RAM and eight gigabyte of ROM (internal storage). It also runs on a powerful 1.2GHz quad-core processor with a battery life of 650 mAh. The smartwatch has a heart rate sensor, a GPS, gyroscope and 4G LTE connectivity you can also insert your sim to receive & send calls and text messages. Haier's Asu smartwatch is rated IP65, making it resistant to dust and water splash from a low pressure nozzle. The tiny projector uses the back of hand as screen on which you can also interact with, located by the watch right hand side which can come in handy when you want to type out your phone number on a date and also to check the time when running or during work out. The smartwatch has a 1.54 inch [240×240] pixel touchscreen. The smartwatch has two buttons on the left hand side, the top button brings notification which you can swipe through to also access a keypad for phone calls, the bottom button also brings you to the home screen with watch faces that can be customized by holding down on the display. The smartwatch also looks heavy, boxy but lighter when worn than it appears to be. 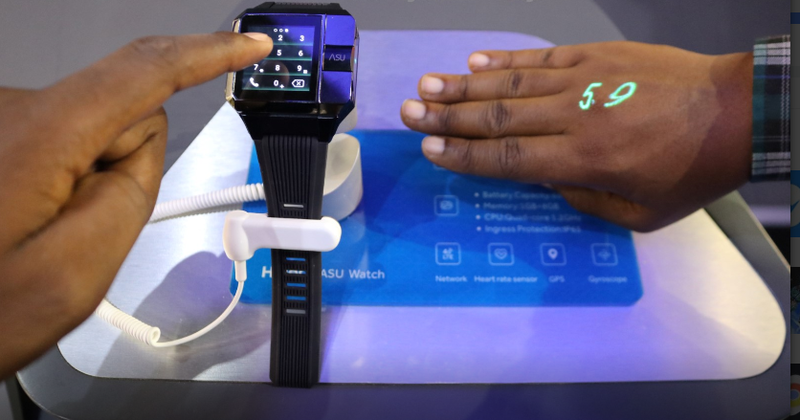 The Haier's Asu smartwatch is available for adult males but with a promise for females soon. According to Haier, the smartwatch will be launch first in china and will be on sale from May, no price has been given yet for the smartwatch and Haier also said it has plans to expand the availability of the smartwatch to other countries in the future. Will this Haier's Asu smartwatch projects all our smartwatch desires ? let’s keep our fingers crossed and anticipate the global launch from Haier.